As if you needed another recipe for Caprese Salad. I don't have any Jersey tomatoes yet, but I can find decent hot house varieties. There is nothing new going on here, except the way I arranged the salad. I used an antique ironstone compote, and overlapped the fresh mozzarella and sliced tomatoes. Tuck in a basil leaf here and there and season w/ the best sea salt & pepper. Drizzle w/ some good olive oil just before serving. And if you want, a drizzle of balsamic syrup works very nicely. You may have seen these already on my instagram page. 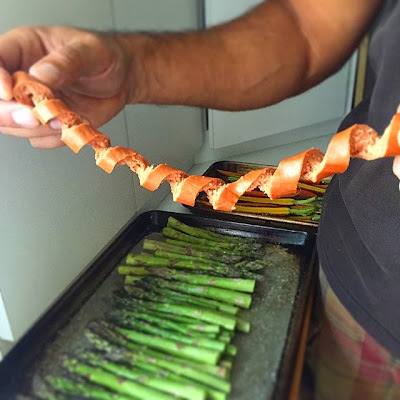 A cool idea to cut hotdogs into spirals. 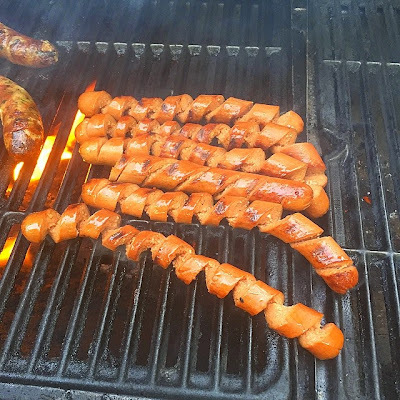 I am a spaz, so couldn't do it, but my husband was able to follow the directions in the Food & Wine June issue to create these delicious crispy spiral wieners. Everyone oohed and aahed over Hebrew National. 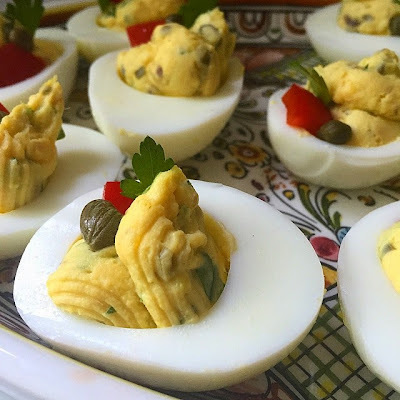 I am loving Marcella Hazan's recipe for deviled eggs. The queen of Italian cooking used chopped anchovies, caper, garlic and fresh parsley, and combined some Dijon mustard and olive oil (I added in some mayo of course). Topped with a red pepper piece. These were delicious. My new favorite. I did a lot of cooking and eating this weekend.......back to quinoa salads. We still do deviled eggs the same way our family has done them for eons. Best Foods Mayo (Hellman’s where you are, Stacey), a little Worcestershire, a drop or two of Tabasco, drained pickle relish, a little dry mustard, Lawry’s Seasoning Salt and pepper. A little paprika on top of filled egg halves. May sound boring to the trendy, but they disappear the minute they hit the table. And I usually make a lot. Love the presentation of your Caprese Salad. 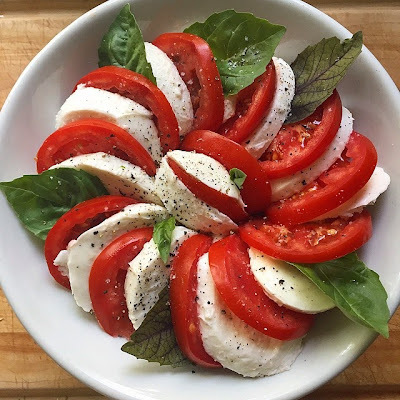 I'm a big fan of this salad and always await the ripening of my tomatoes late July into August, although some hothouses have decent-tasting tomatoes from Ontario, which I like. The hotdog spiral is cool! How does one eat it?